The Hinderer Knives Investigator Modular Pen with Black Ink is crafted from CNC machined Stainless Steel with Spiral milling on the body for a great feel and added traction in the hand and the new "Battlefield Pickup" finish. This is one battle-tough pen that will handle all your every day writing tasks while maintaining a high-speed, low-drag profile. 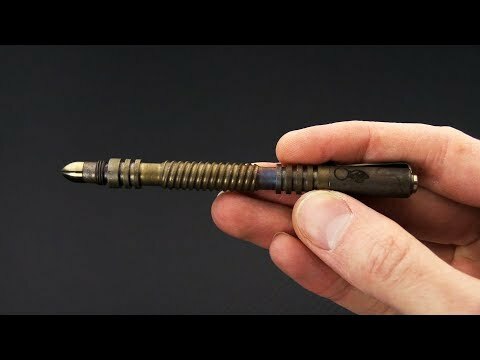 The "Battlefield Pickup" finish is a heavy patina that gives each pen a brassy look and unique, hand weathered finish. Lightweight and built to take a beating and give one, the Investigator was designed to be as small as a standard size refill would allow, yet still be usable in a tough situation. Uses Fisher Space Pen full size refills (pn# SPR4B).